The Mumbai Port Trust is planning to launch a Roll on Roll Off Ship (Ro-Ro Ship) between Mumbai and Alibaug. The commuters will be able to even take their cars inside the ship, saving them the three hours drive. The Ro-Ro will have space for 10 buses, 40 cars, and 250 passengers. The total journey time will be a mere one hour. 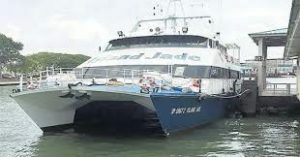 The fare of this ship will be around Rs 300-400 for cars, Rs 700-800 for bus and Rs 200-300 for passengers. This service will also benefit people traveling to Mandwa, Alibaug, and beaches like Murud-Janjira, Velas, Shreewardhan, near the Dighi port. The service will start from new Ro-Ro terminal at MbPt and Mandhwa/Dighi port. The Mumbai Port Trust also plans to extend this services to Nerul, Panvel, and Belapur. Rs 40 crore Ro-Ro ship will be purchased by MbPT, Maharashtra Maritime Board, Jawaharlal Nehru Port Trust, and City Industrial Development Corporation. Each will pay Rs 10 crore.